Our Non-Smoking King Bed room type is our standard room that can accommodate 2 guests. Guests staying in this king bed room can enjoy amenities that include cable TV with HBO, iron and ironing boards, a microwave, refrigerator, coffee/tea maker, and work desk. While visiting Monterey we want to provide you with a comfortable and stress-free stay, so each room includes a private bathroom with a shower/bathtub, complimentary toiletries, plush towels, and a hair dryer. For all guests staying at the lake front Monterey Bay Lodge, free WiFi is provided in all rooms and common rooms. The 2 Queen Bed room type is a Non-Smoking room that is a perfect and convenient room for those traveling to Monterey as a party of 4. 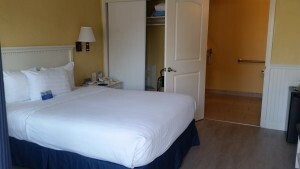 This room type features a private bathroom with shower/bathtub, complimentary toiletries, plush towels, and a hair dryer. More featured amenities include an iron and ironing board, a microwave, refrigerator, coffee/tea maker, cable TV with HBO, and a work desk. Free WiFi is available in all areas of the lake front Monterey Bay Lodge. This Non-Smoking Queen Bed room includes a fireplace, making this room type a perfect accommodation for couples. With this room type guests can enjoy a microwave, refrigerator, coffee/tea maker, work desk, cable TV with HBO, and free WiFi. Each of our comfortable rooms include a private bathroom with shower/bathtub, complimentary toiletries, plush towels, and a hair dryer. This room type at the lake front Monterey Bay Lodge is the perfect spot for those looking for a romantic getaway to the beautiful city of Monterey. This charming King Fireplace Deluxe room includes a spa for those wanting to relax in a comfortable room after a day of touring the beautiful city of Monterey. With this room type guest enjoy a private bathroom with a shower/bathtub, hot tub, complimentary toiletries, a hair dryer, and plush towels. Included amenities provided for comfort include a microwave, refrigerator, coffee/tea maker, iron and ironing boards, fireplace, cable TV with HBO, a work desk, and free WiFi. 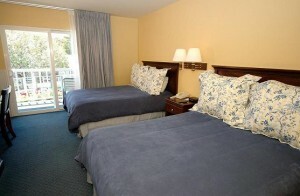 Our King beds provide comfort for a relaxing stay to both leisure and business travelers visiting Monterey. The Non-Smoking Family Room type is perfect for a party of 4. Our plush queen-sized bed along along a separate room with a comfortable bunk bed provide comfort for all guests staying at the lake front Monterey Bay Lodge. This room type includes a private bathroom with a shower/bathtub, complimentary toiletries, a hair dryer, and plush towels. Other provided amenities include an iron and ironing board, cable TV with HBO, work desk, a microwave, refrigerator, coffee/tea maker, and complimentary WiFi. 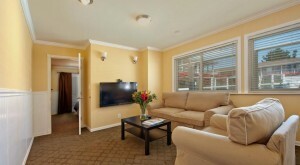 This spacious Family Room type provides comfort for all ages while visiting the beautiful city of Monterey. This 1 Bed Room Suite is a spacious, Non-Smoking room that can accommodate 2 adults and 2 children. 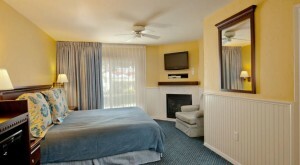 This room type is provided for comfort for both leisure and business travelers while visiting Monterey. A kitchenette is provided in this large family-sized room and provides all amenities for a comfortable and stress-free stay. These amenities include pots and pans, silverware, coffee/tea maker, a microwave, and a full-sized refrigerator. Relax in the living room with a Flat Screen TV, DVD player, Play Station, and Cable TV with HBO Channels. Guests staying in this room type can enjoy a full, private bathroom with complimentary toiletries, hair dryer, and plush towels. The lake front Monterey Bay Lodge offers Free WiFi in all rooms and public areas. Roll in Shower for Wheel Chair, Standard, 1 Queen Bed, Micro/Fridge, Coffee Maker, Cable TV w/HBO, WiFi, Iron w/Board, Wall heater/ portable fan and Free Parking.